On December 5th, e-Governance Academy and National Information Systems and Services Agency (ASSI) of Benin Republic signed an agreement to design and implement the governmental interoperability framework for enhancing secure data exchange between government authorities and developing e-services for the citizens of Benin. 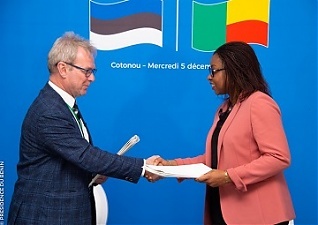 The agreement was signed between Arvo Ott, Director of e-Governance Academy of Estonia and and Minister of Digital Economy and Communication of Benin Republic, Ms Aurélie Adam Soulé Zoumarou. According to Arvo Ott, the cooperation with the Government of Benin, which started two years ago with the visit of the President of Benin to Estonia, has developed from counseling and training to the technology deployment phase. "There is no alternative to e-government. The digital transformation requires, in particular, political will. Benin has demonstrated it by a number of high-level meetings in Estonia and Benin. The e-Governance Academy is proud to be a partner for Benin in developing e-government and transferring experience and knowledge from Estonia and the rest of the world to Benin," said Arvo Ott. “Success of the Estonian e-government model has inspired us to further develop the e-government system in Benin and redefine how we communicate with our citizens and how we build business opportunities. Launch of the secure data exchange framework is one step in our digital transformation process and it will not be the last,“ said Maximilien Kpodjedo. The governmental interoperability framework development includes the Estonian secure data exchange platform based on the Estonian X-Road model with UXP (Unified eXchange Platform software) and a catalogue of interoperability solutions. The data exchange platform will be developed by the Estonian IT company Cybernetica LLC. Riho Kurg, Head of UXP at Cybernetica, the technology partner for implementing the new data exchange solution, stated that the cooperation with Benin is a welcome step in what has already been a fruitful collaboration. "We have previously engaged with e-Governance Academy in Africa in the successful implementation of the data exchange platform in Namibia. We are very glad for the long-standing partnership and are excited to embark on the next project together," Kurg said. E-Governance Academy will support ASSI in developing the organisational setup, regulatory framework, the catalogue for interoperability solutions, guidelines, procedures and key standards related to the e-government interoperability system. Moreover, e-Governance Academy will organise related training studies for the officials and IT specialists of Benin. The Estonian data exchange platform is developed and deployed in Finland, Ukraine, Namibia, Haiti, Kyrgyzstan, Azerbaijan, Faroe Islands, Cayman Islands and Palestine.